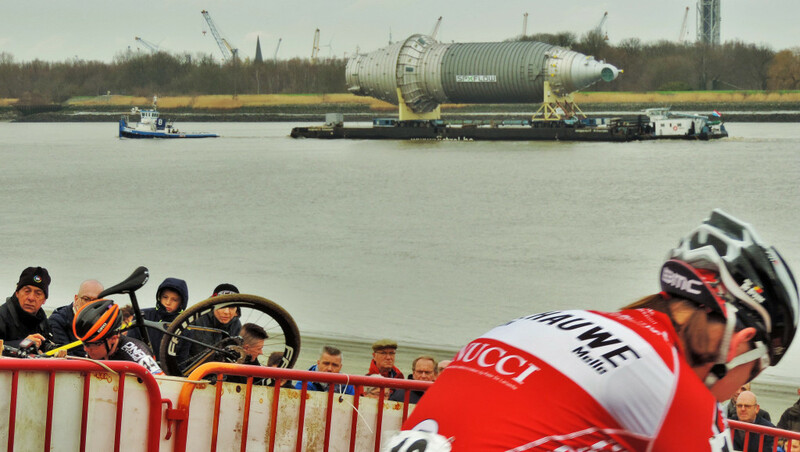 On the first day of CXmas there was SCHELDECROSS. So, what do we get with this is course? As has been the story of the season, the course is firm and fast, especially as it is mostly flat. Like at Hasselt, the course heads through the park and includes the kiddies playground. The sand this time though is provided by the beach that runs along by the side of the river Schelde (the same river from Hamme – check your maps). Of course the harbour is hugely impressive and if anyone is interested there is a company doing bike tours. 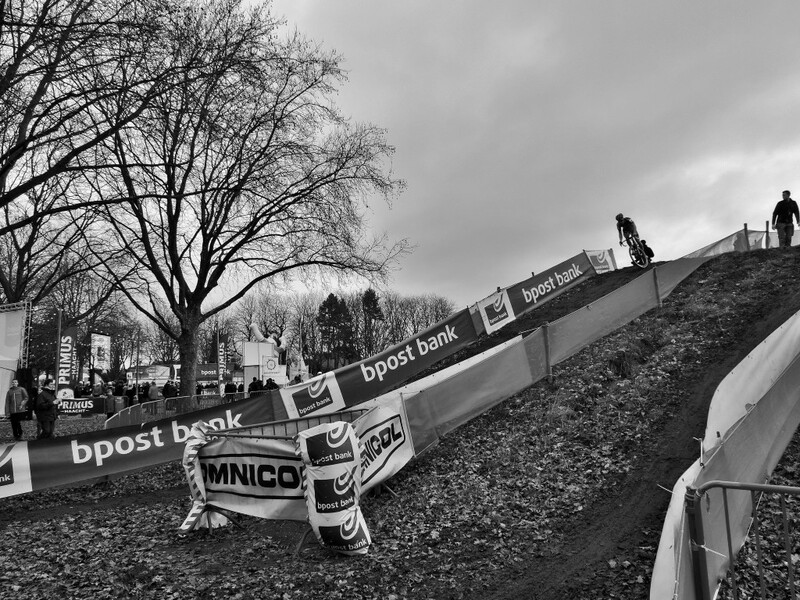 But what we are here for this day is CYCLOCROSS YAY! I arrived just in time to see the last laps of the Newbies race, but I was feeling stingy with taking pics having run out of battery last time! Pretty sure it was Niels Vanderputte getting the win again and I’ve already said plenty about the girls not getting their efforts recognised. Off I went for a wander. It’s actually quite a short course at only 2.5km. The campervans were easy to get to on the road in front of the park or on the camping ground that comes with YAY! facilities, which many of the young riders and those not supported by big budget teams certainly appreciate, especially not having to get changed in the backseat of the car! So, to the Juniors and there’s a new name for you to conjour with, Reno Bauters. Yep, I too am wondering if his parents did the Beckhams thing! Glad they had a great time! I was pissed off about the 2.50 euros for the worst coffee this side of Berlin’s Ostbahnhof (just don’t), but I got my friets fix with the U23 guys. 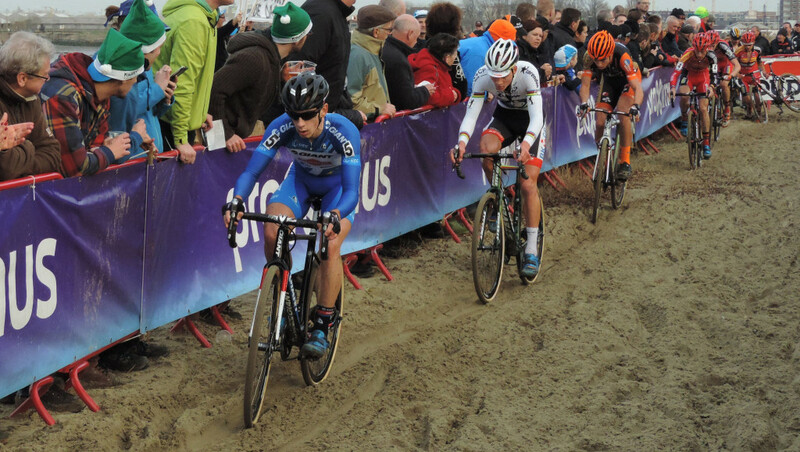 No Eli Iserbyt again at BPost Bank Trofee so Quinten Hermans was challenged by Daan Hoeyberghs, Yorben van Tichelt, Adam Toupalik and Nicolas Cleppe. These guys dealt with the sandpit hairpin with what I’m calling the “Bar sling trail 180″(dude). It would be an air sling but the trick is to get a nice sector mark in the sand as demonstrated here by young Roel Vandael. I haven’t worked out a point scoring system yet, but there should definitely be extra for a complete semi-circle. As we are a hop, skip and a jump from K-Pauw central, I am expecting to run in to a few familiar faces and they didn’t disappoint. I am so chuffed when they recognise me, but maybe they issued warnings about a mad Kiwi ‘Approach with caution’! And SOOOO good that the Women’s Race is on TV again. BPost Bank recognising that women use their services too! What a good fast race. 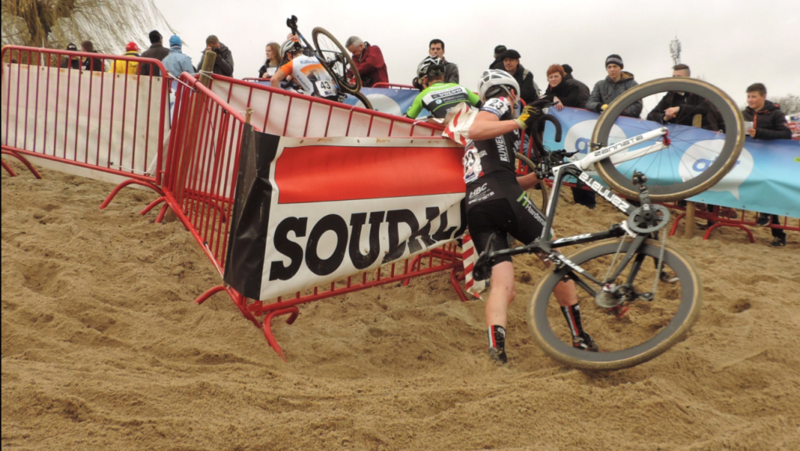 Not huge descents or hills, but an intriguing contest with Sanne Cant coming out on top, but Helen Wyman kept her honest right up to the last sand run with Sophie de Boer hot on her heels. 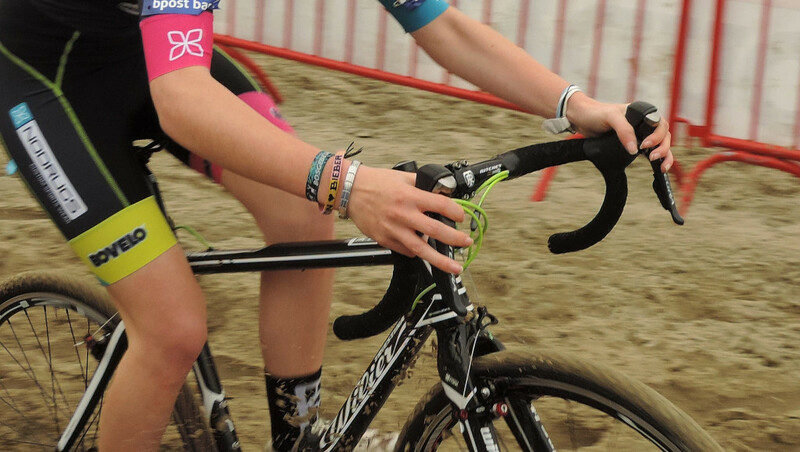 Maud Kaptheijns is proving herself to be the top talent of the U23 women coming though. Between the Women’s and Men’s race I got a chance for a little sit down, but didn’t stray far from my spot for running backwards and forwards between the tree hairpin and the sand-run. 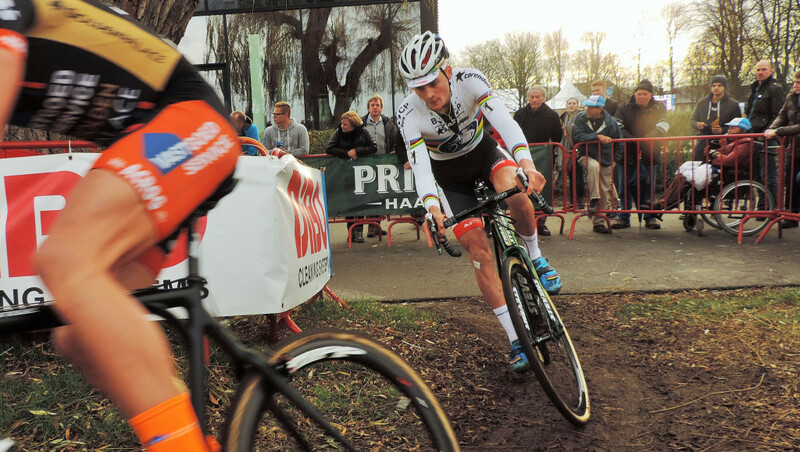 The Sven Nys Farewell Tour was ongoing today. 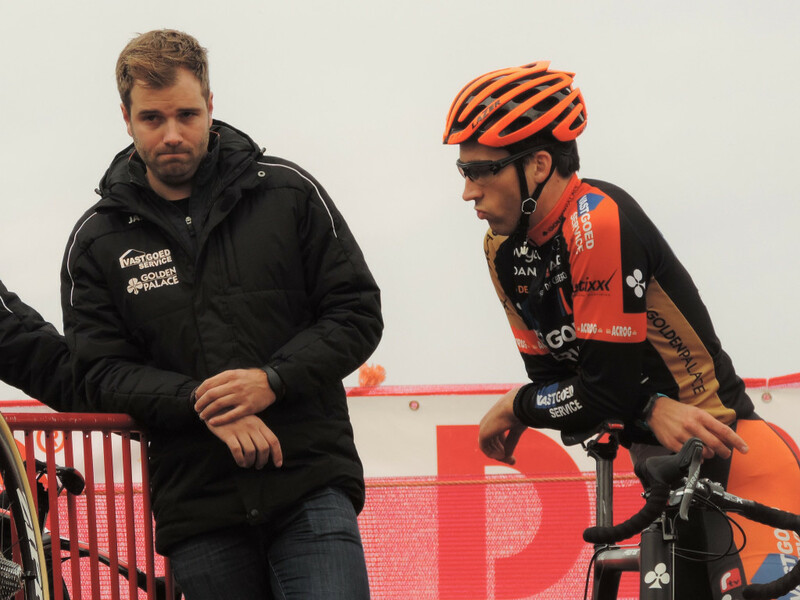 We felt there were some tactics employed today from the orange guys. 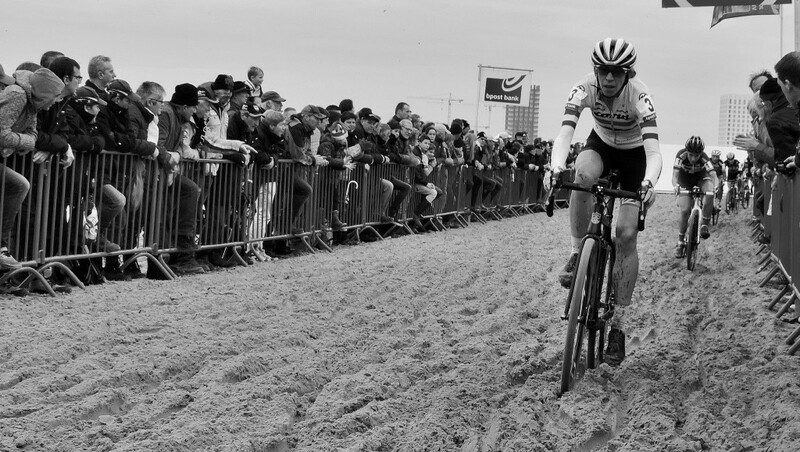 It seemed that Wout tried the ‘slow them in the sand’ trick at the far end wiggly bits, but that didn’t work and the next lap we saw him step off his bike on the little hill causing Lars to run into him and fall catching everyone behind him. 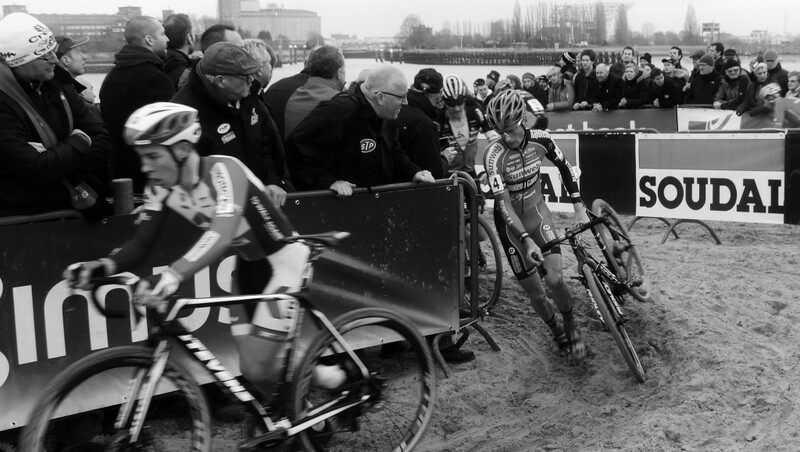 By time Lars was up and everyone back on their bikes Wout and Mathieu were gone gone GONE! At least, that’s what it looked like to me and Lars was well and truly Wouted! So it was all on for third place. By the last sand-run Sven had been dropped and it looked like the speed had go the better of Kevin and despite our loud encouragements he had to give way to Lars. 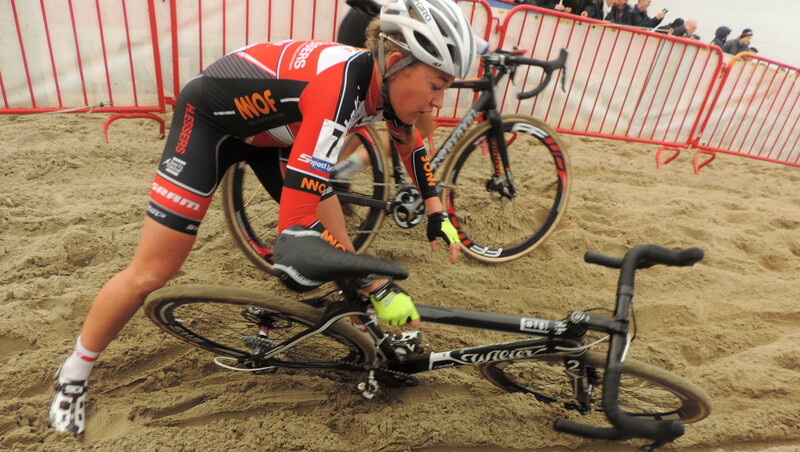 Question – Has Lars fallen at every sand based race this season? 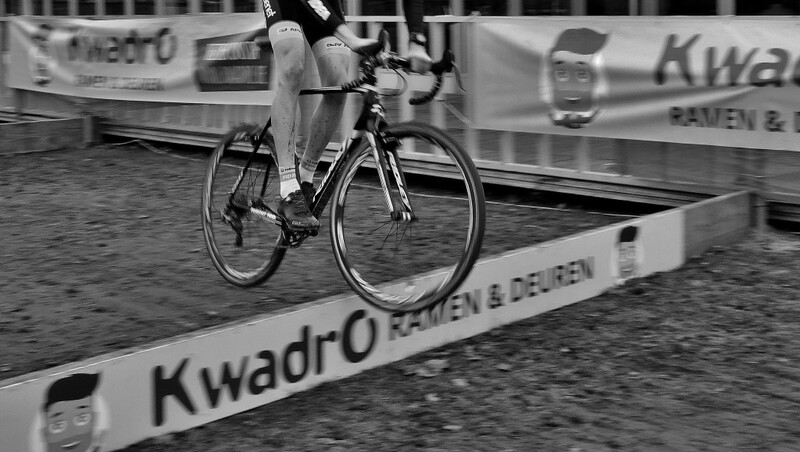 Wout’s win did not seem to be that popular today. Are people tired of the same person winning? Did they see questionable tactics? 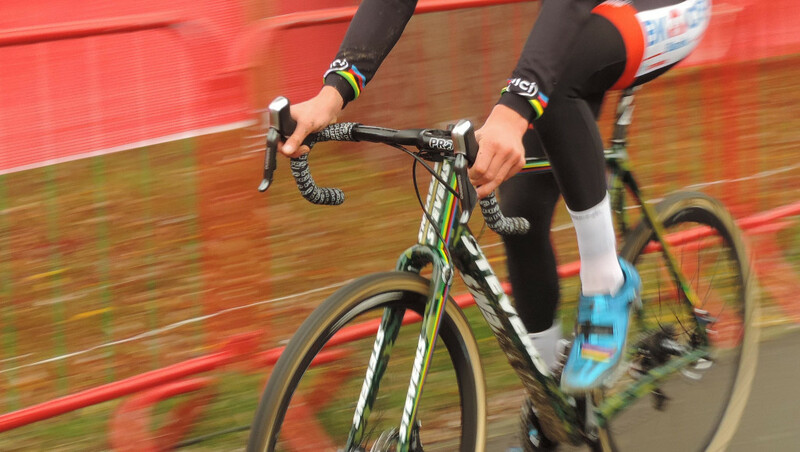 is Wout just not Sven? Whatever it is, people were leaving before the end like they do at football matches and not many stayed for the podium, including myself, I admit. I think it was just that someone asked me if one of the Juniors was my son that I was feeling a bit down! At least I got a GPON and tomorrow the guys are fetching me to go to NAMUUUUUUUUR!